If you have any information about these crimes or any person(s) involved, you are urged to call Crime Stoppers at or submit a Web Tip . You do not have to give your name. CRIME STOPPERS will pay a cash reward of up to $2000 and you can remain anonymous. Stolen 2012 load trail 14 foot trailer. Stolen from most pure heart of Mary rectory at 1741 SW Stone on 2-24-19 at 7:45pm. Please look at this photo of the suspect's truck. 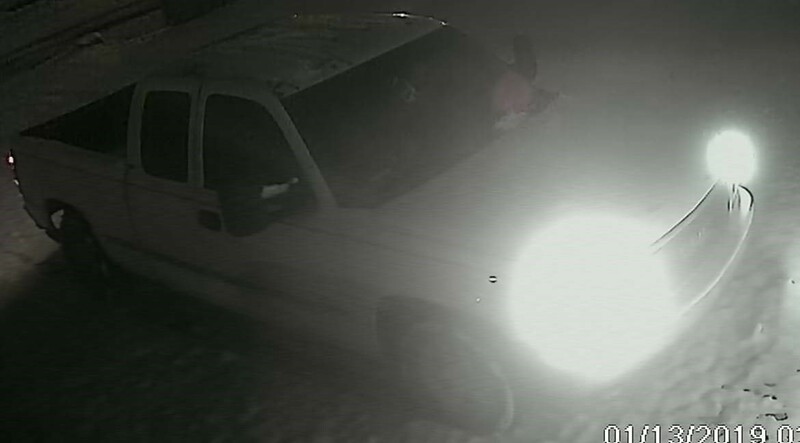 It is possibly a 2000-2010 GMC white extended cab pickup with tow package side mirrors. This is reference a theft of two trailers that contained some ATV's and an engine. This happened between Jan 11-13 2019 at 301 NW REO. Over the last few weeks there has been an increase in criminal damage cases across Topeka. These cases involve car windows being shot out in the overnight hours. In the last 24 hours there have been at least 14 cases reported in the city limits. 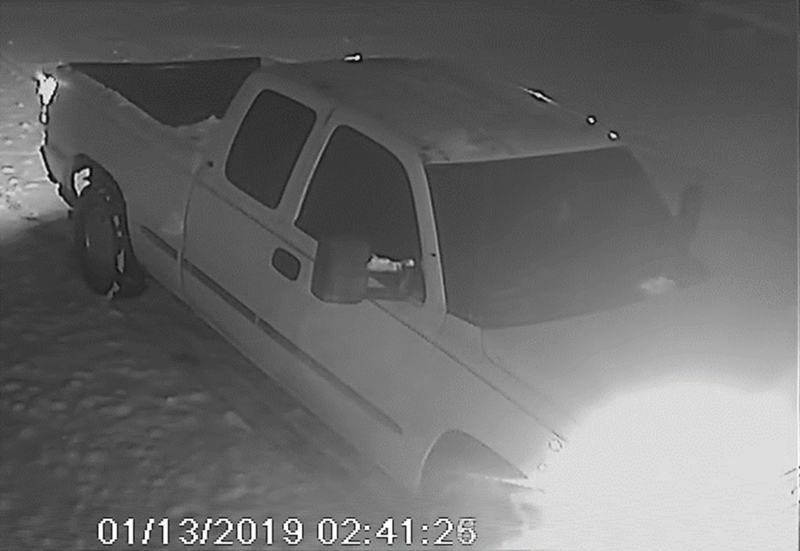 Shawnee County Crime Stoppers is offering up to a $2,000 reward for information that leads to an arrest in the recent criminal damage cases. 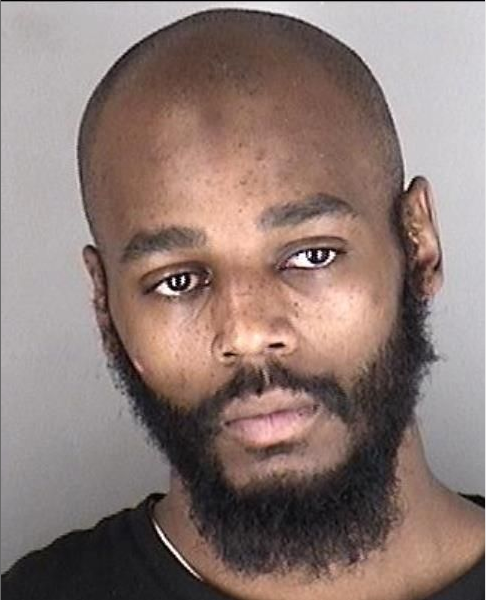 On 12-3-2018 at approximately 6:30 pm the Topeka Police Department responded to the area of 13th and SW College in reference to a robbery/shooting. Police are looking for any information about the robbery or suspect, described as a black male, possibly 5'08" to 5'10" in his twenties to mid thirties, wearing baggy blue jeans and a hoodie armed with a handgun. The victim was shot during the course of the robbery and the suspect stole the victims 2013, gray, Toyota, Tacoma, pickup, which has been recovered. November 8, 2018, there was an armed robbery that occurred 3600 SW Topeka, BLVD Topeka, Kansas. The robbery occurred in the parking lot of Panchos restaurant. The suspect description is a African American male described as approximately 6'4/180Ibs, wearing white pants, white shoes and red shirt underneath a gray hooded sweatshirt. The subject displayed a weapon during the robbery and took the wallet from the victim, phone and candy. The subject fled in a blue or grey Chevrolet Malibu. On September 29, 2018, a bank near 29 and Urish was robbed. 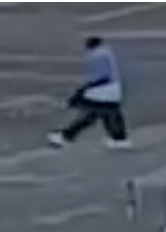 The subject is described as a African American male, approximately 601’ to 604’, approximately 300 pounds, wearing a light blue zip-up jacket, dark colored pants and white tennis shoes. 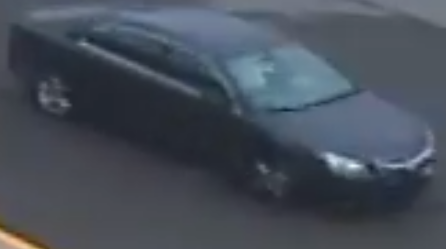 The suspect vehicle is described as a black Chevy Malibu (Unknown tag), eighth generation 2012-2016. Look at these photos and call with any infomation. You could earn a cash reward! ON 07-04-18 at approximately midnight 2 suspects robbed a fireworks stand at SW 29/Urish. During the course of the robbery shots were fired by the suspects and also by one of the victims. Cash from the business and also from a victim were taken. The suspects were described as 2 black males. One being approximately 6'-6'2" and 200 pounds. The other approximately 5'"8" to 5'"10" and thin. They were both described as having something covering their faces. At least one of them was armed with a handgun. 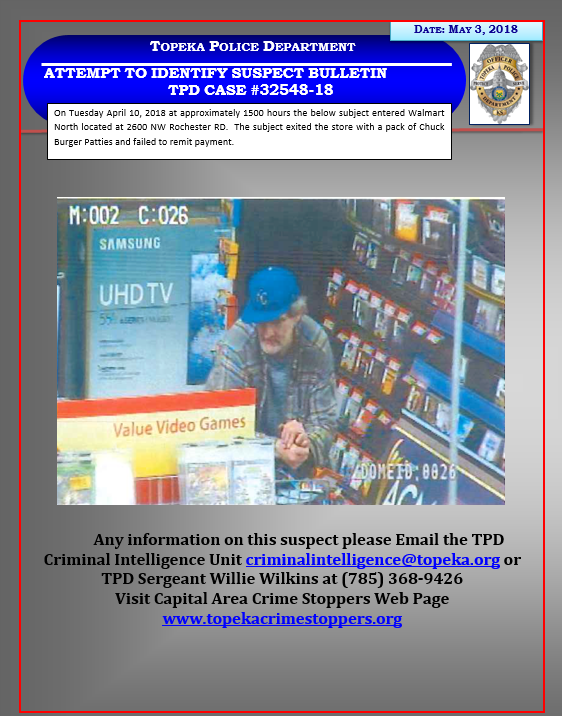 If you have any information about this case call Crime Stoppers at 785-234-0007. You will be eligible for a cash reward and you will remain anonymous. Around 1200 PM on 01.23.18 John Austin Jr and John Austin Sr were both shot while at 2048 S Kansas. Two black male suspects were witnessed running from the scene and left the area northbound in a red Dodge Durango. John Wesley Towner was later arrested for his involvement in the incident. However, a second suspect remains at large. This second suspect has been described as a black male that is shorter, stockier, and appeared younger than Towner (who is 6’ tall, 185 pounds, and 30 years old.) It was reported that the second suspect had short hair and no facial hair. 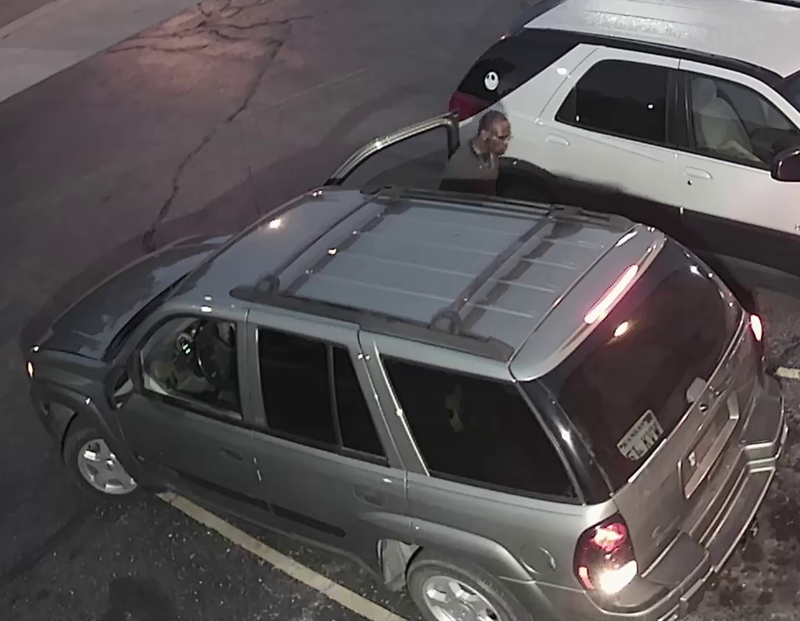 On 6-4-18 between 0500-0630 this subject and vehicle involved in a vehicle burglary and criminal damage in 3300 blk S. Kansas. Attempt to identify the subject for theft from Walmart located at 2600 NW Rochester RD. On March 4th 2018, Walmart located at 1501 SW Wanamaker reports the four suspects shown below stole several Xbox gaming systems. They were seen leaving in the dark colored car. Between December 5th 2017 and January 9th, 2018 an unknown subject(s) broke into three different storage units located at 1441 SW Auburn Road in Shawnee County, Kansas. They removed several thousands of dollars with of household property from one of the storage units including two large limited edition photographs. 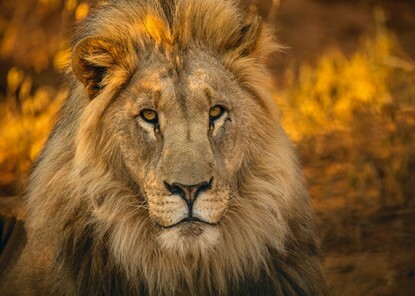 Those photographs were identified as “The Aviator” and “Majestic Sprit” both by Peter Lik. If you have any knowledge as to who broke into the storage units or the location of this property, please contact Det. Ryan Myers at 785-251-2262 or ryan.myers@snco.us.